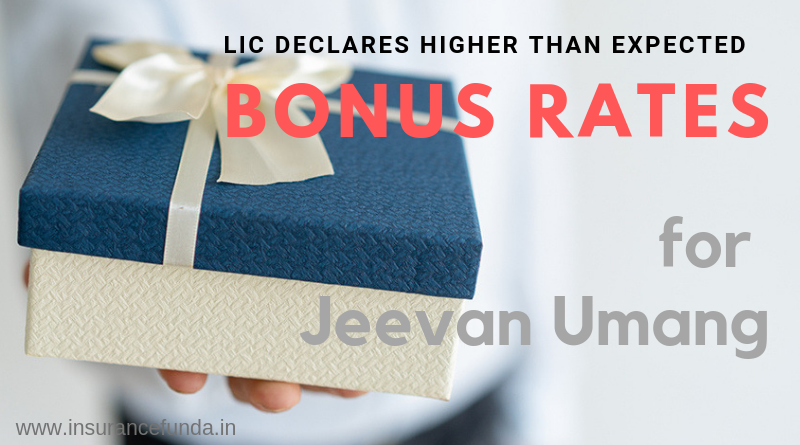 Life Insurance Corporation of India (LIC) has declared a higher than expected Bonus Rates for its innovative guaranteed benefit plan, Jeevan Umang for the valuation period from 1st April 2017 to 31st March 2018 . Jeevan Umang is a specialized endowment type of plan which provides a guaranteed income benefit at the rate of 8% of Sum Assured (per annum) after the premium paying period. It also offers life long insurance coverage and value appreciation even after the premium paying period. Read more on the features and benefits of Jeevan Umang. Jeevan Umang was introduced by LIC of India on May 2017. As the bonus rate for the plan was not declared at the time of inception, ‘Benefit Illustration’ as per the IRDA stipulation was the only direction and ‘Guide Wire’ available at that time, towards the expected returns from the plan. What is a benefit illustration? Benefit Illustration of Jeevan Umang Plan. Jeevan Umang – Bonus rates – during and after the premium paying term. Jeevan Umang – Expected Final Addition Bonus Rates. Benefit Illustration of Jeevan Umang downloaded from the the website of LIC of India is shown below. As per the benefit illustration provided above, if LIC can achieve a gross investment return of 8 % for this plan, the expected bonus amount has to be Rs. 22500 for a 5 lakh sum assured policy with premium paying term of 15 years. In other words, the expected bonus rate is Rs. 45 per thousand Sum Assured. Bonus Rates for Jeevan Umang was declared for the first time on the 2017 – 18 valuation and the declared rates are as follows. The bonus rates declared are considerably higher than the benefit illustration (Scenario 2) bonus rates. It implies that LIC is getting a gross investment return higher than 8% in Jeevan Umang plan. The Chart provided above will help you in comparing the scenario-based and actual bonus rates. If you are unable to view the chart, please refresh the page. One specialty of Jeevan Umang plan is that the bonus rates during the premium paying term and after the premium paying term are different. Afforementioned bonus rates shall be added to the plan during the premium paying term. Exact details of the bonus rates after the premium paying period shall be known only as and when it is declared by LIC. But, if we follow the benefit illustration 8% scenario, we can see that the bonus after the premium paying term is roughly 50 % of the rates during the premium paying term. This fact can help you in arriving at an estimation of the death coverage and maturity benefit of the plan. The following chart shows the expected Final Addition Bonus rates of Jeevan Umang plan based on the 8% gross investment return scenario. Jeevan Umang Online Premium and Benefits Calculator provided below can help you to understand all the benefits of the plan. You can provide your own details and get details such as Premium, Insurance Coverage, Survival Benefit details, Maturity Amount, Surrender value etc. *The calculations and the expected bonus rates provided in this article are intended to help in understanding the details of the plan. The rates provided are not guaranteed and can vary based on the experiences of LIC of India. Please refer LIC web site for more details.